Painting is one of the arts Italians are famous for. Leopoldo, a skilled artist, born in Tuscany, will teach you several techniques to reproduce breathtaking landscapes or inspiring still nature compositions. Through hisrprofessional assistance, he will also help you understand the spirit of this figurative art by fostering your personal capabilities. 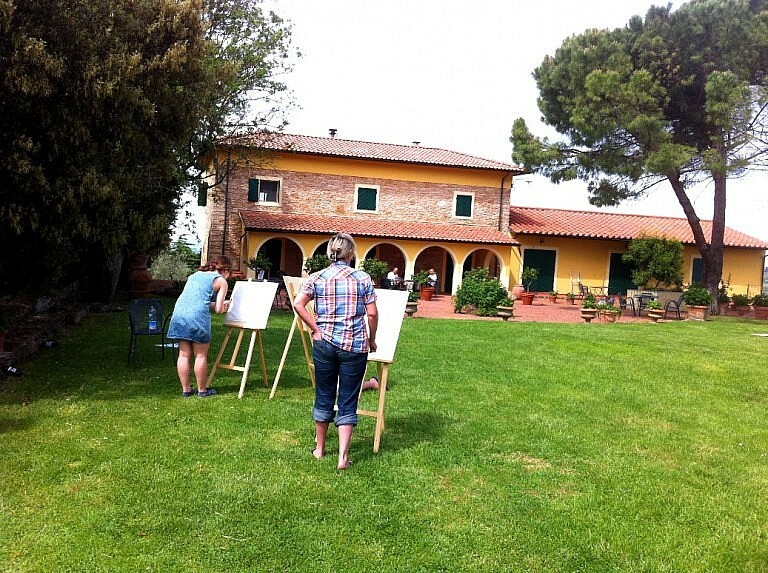 Our 3-hour painting experience takes place in your agriturismo, villa or holiday house or in the countryside surrounding it, in marvellous scenic settings where you can get the best inspiration for your paintings. 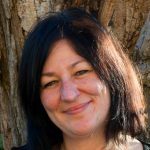 An English speaking assistant – also German, French, Spanish, Russian available – will facilitate communication with the artist. 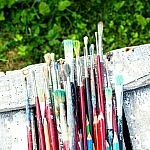 The painting techniques will be agreed during your booking and range from watercolor, to acrylic to oil painting. 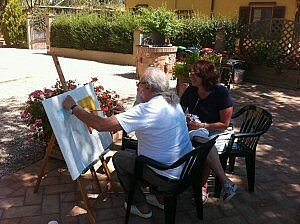 The half-day painting experience in Tuscany can be repeated in a more-day painting package. 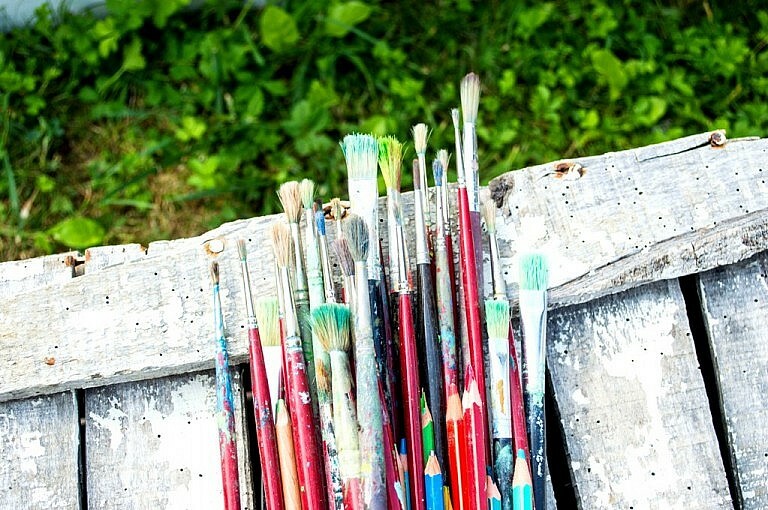 This activity is particularly advisable to creative people and to families with children. All necessary materials and tools used are provided by the artist and are completely safe. 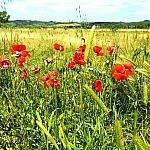 You create your personally inspired souvenir of your stay in Tuscany in just 3 hours. 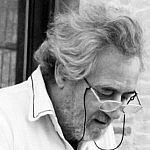 Leopoldo is an original and talented painter from a small village in Tuscany called Terricciola. He developed his very peculiar style through decades of career. In 2013 he joined Arianna & Friends to teach painting to visitors of the area. His sarcasm and attitude are also part of our painting experiences with him. If your location is more than 90 minutes driving from our premises in Peccioli a surcharge applies. Please, give us full details of your location for a quotation. Luca and Leopoldo were absolutely wonderful – they made the experience very special. My family loved it – please pass on our thanks and kind wishes. Just a quick note to thank you and the team very much for the incredible job you all did during our recent trip to Tuscany. Special thanks to Massimo and Consuelo for helping solve the GPS problem, the replacement Tom Tom worked extremely well and was a definite “must have” for foreigners trying to navigate their way around Italy. 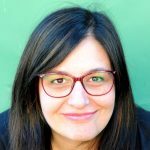 Also, to Massimo and Veronica for joining us and translating during our Cooking and Painting classes, their knowledge and experience, without a doubt, enhanced our experience during each of them. With regard to the Pastry & Pizza Cooking Class we did with Massimo, he mentioned that copies of each of the recipes will be emailed to us, can I also remind you about that please, as we haven’t received them yet? 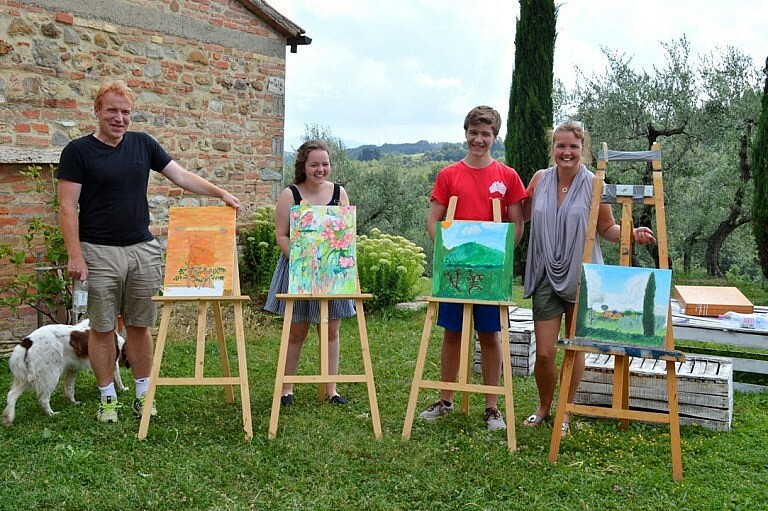 Our in-home painting classes take place in any location in Tuscany within 90 minutes from our premises in Peccioli, Pisa area. Our fees vary depending on the distance of your villa from our premises in Peccioli. If your accommodation is at a distance further than 90 minutes driving from our premises, a surcharge applies. Please, give us full details about your location during the booking procedure for a quotation. Our painter and assistant drive directly to your location so the meet-up location is at your premises. Please, give us details about your location during the booking procedure. This program takes 3.5 hours. Please, consider 30 minutes to prepare the setting of the class and 3 hours for painting. No need to consider transportaion for this kind of activity as the class is delivered to your villa or accommodation place. This activity is delivered to your premises so no transportation is to be considered in the organization. 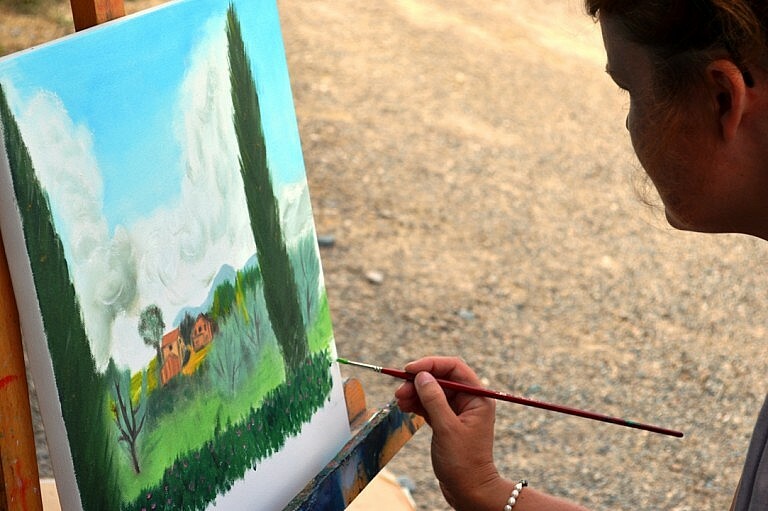 Be inspired by the stunning landscapes surrounding your villa in Tuscany and meet our local artist for a memorable painting class! We bring all you need and you shall simply start… in just 3 hours you can make your personal souvenir of Bella Toscana.